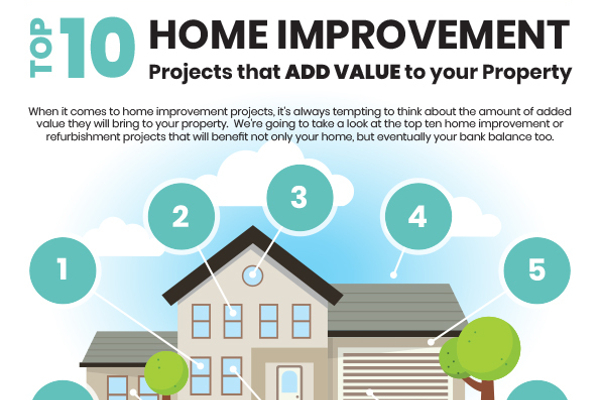 When it comes to home improvement projects, it’s always tempting to think about the amount of added value they will bring to your property. 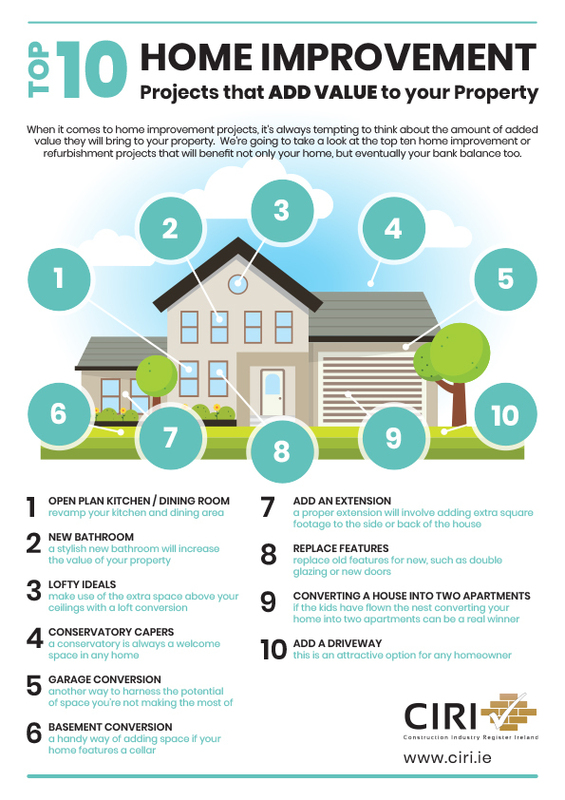 Today we’re going to take a look at the top ten home improvement or refurbishment projects that will benefit not only your home but eventually your bank balance too. OPEN PLAN KITCHEN/DINING ROOM – According to research, spending around €4000 on revamping your kitchen and dining area can add up to €50,000 to the value of your home. What’s more, you’ll have a much more pleasant place in which to cook and dine. NEW BATHROOM – while a stylish new bathroom will increase the value of your property, it’s an expensive investment that may involve quite a bit of disruption, especially if you’re moving the sanitary ware and relocating soil pipes and water inlets, so this is a project to think carefully about before you begin. LOFTY IDEALS – A loft conversion allows you to make use of a large amount of space above your ceilings. There are several different types of loft conversions available to you and how much extra space you gain depends entirely on the total size of your roof. CONSERVATORY CAPERS – a conservatory is always a welcome space in any home, a light and airy room which can be used as a breakfast/dining room, playroom, home office or a space to chill. However, you may be surprised to find that the conservatory is too cold in winter and too hot in summer. If you plan on adding a conservatory, make it an all-year-round room by opting for a properly tiled roof, rather than a glass roof. There are lightweight tiles available on today’s market that allow for the conservatory roof to be insulated too, which will keep you cooler in summer and warmer in winter. GARAGE CONVERSION – this is another way to harness the potential of space that you’re not making the most of, especially if you leave the car on the driver overnight. Most garages feature a flat roof and an effective insulating layer can easily be added during the building process to ensure that the new room is cosy at all times. BASEMENT CONVERSION – another handy way of adding space if your home features a cellar that you don’t make full use of. Because cellars can be cold and draughty, it would be worth looking at underfloor heating when planning the work. ADD AN EXTENSION – a proper extension will usually involve adding extra square footage to the side or back of the house, but this does come at a cost as you lose some of your garden space. The most popular room to extend in this way is a smallish galley kitchen and it’s often possible to add extra space upstairs at the same time with an extra bathroom or small bedroom built above the extension. REPLACE FEATURES – replacing old features for new (such as double glazing, new doors, a combi-boiler or rewiring) will not only add value to your property, it will increase the overall comfort of your home. CONVERTING A HOUSE INTO TWO APARTMENTS – if the kids have flown the nest and you’re finding the house too large for you, but are settled in the area and don’t want to move, converting your home into two apartments can be a real winner. Not only do you reduce your living space into one that is easier to maintain and manage, you can rent the second apartment out to provide yourself with extra monthly income on a long-term basis. ADD A DRIVEWAY – if you have space in your front garden, this is an attractive option for any homeowner. The eventual result will be that you cut down on the amount of gardening work you have to do and your vehicle insurance premiums will be reduced due to the off-road overnight parking – almost as if this is a BOGOF (buy one, get one free) saving! Before you embark on any home improvement work, it’s best to have your property valued as it is, so that you can make an informed comparison about how much return on your investment you’re likely to see in the future.